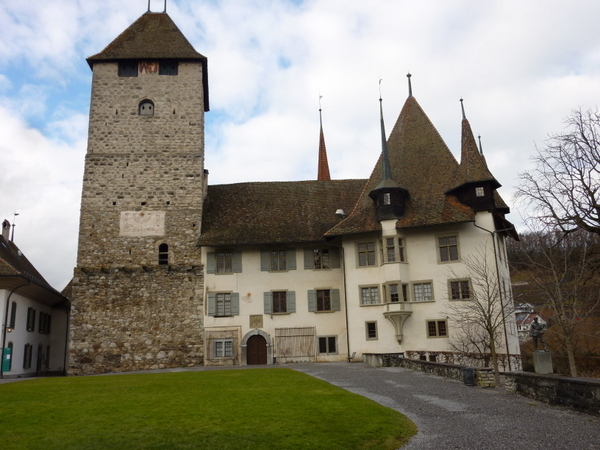 I wasn’t going to blog today (January 5) but we had such an interesting experience in Spiez, Switzerland, I had to write. We had a 3 hour layover in Spiez, waiting for our train to Milano. Good time for a walk and lunch. Spying the restaurant in the train station, I checked the menu just-in-case that was our only option. 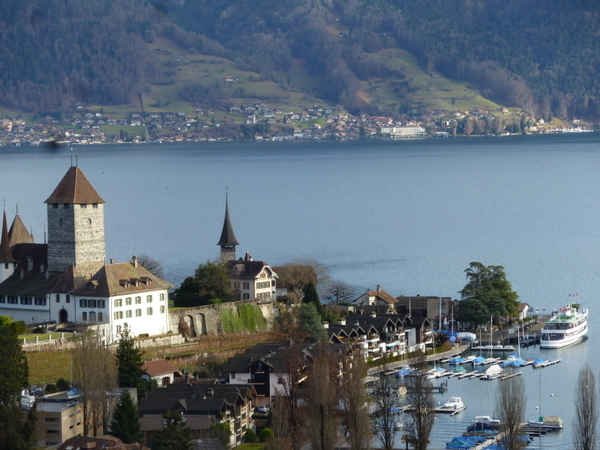 Spiez is small, it’s Sunday in religiously conservative Switzerland, and choices might be limited. In the U.S. certainly, and for the most part in Italy, one would not expect much in the way of “cuisine” in a railroad station these days. In Italy you can get a good panino to-go, decent wine, pastries, and of course, fine espresso on-the-run. In my limited experience in train stations in the U.S., all I have seen is over-cooked hotdogs, bags of chips, and similar culinary delights. Gone are the days of white tablecloths, crystal glasses and sparkling flatware with “home-cooked” Sunday dinner. My expectations were not high for Spiez. another option. To our surprise the Restaurant Bahnhoff Buffet was thronged with diners (most of them older than we are) and the clock was only touching noon! Despite the fact we did not have a reservation (who knew?! ), they seated us next to a cute old couple (yes, even to us they were old) and their ancient hund. Although my German is almost non-existent, it was better than the server’s English, so we managed to order one of the four daily specials. It was the best meal at the best value of any we had in Switzerland the past few days! Starting with potato soup, we then had access to a salad bar. Fish filets, potatoes and carrots. The big yellow things are NOT lemons. They are buttered potatoes. 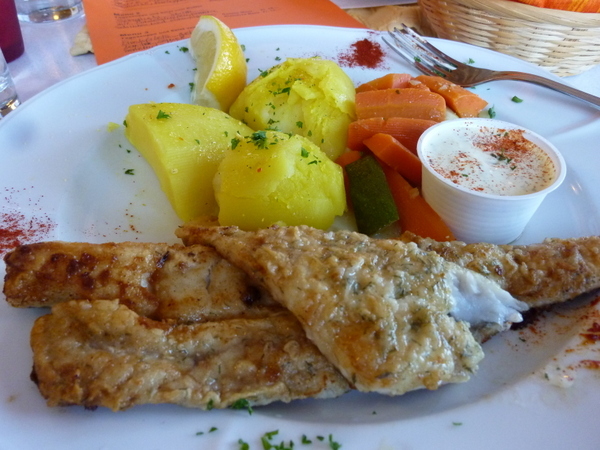 In typical efficient Swiss manner, much like dining in small town USA, the entrées were delivered before we could finish our salads: perfectly pan-fried perch, buttered potatoes, al dente carrots, side of tartar sauce. I felt like I was back in Lindstrom, MN, having the Sunday dinner special at the Dinner Bell Café, except there the fish would have been walleyed pike. The tables were lined with locals whom we suspect eat there every Sunday. For CHF 19.50 (about Euro 15.85) per person we had a 3-course fresh, reasonably healthy meal. Of course, in typical local fashion, a glass of mineral water and a cup of coffee were about CHF 4.00 each, clearly a profit generator. We were thus successful in emptying Ric’s pockets of Swiss francs before returning to Italy. Another reminder of small town USA “dining:” Elapsed time from entering the restaurant to exiting: 45 minutes. In Italy we’d have barely finished in time to make our train 2 hours later. 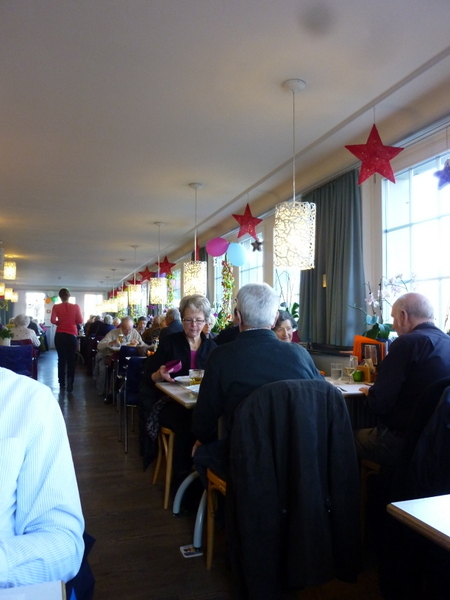 The dining room at Restaurant Bahnhoff Buffet, full of locals, no English. Another amazing thing I have not seen in all of our travels the past 3 years: lockers. Switzerland apparently is not in fear of people who would do harm leaving objectionable items in stations. For CHF 5.00, we were able to secure both suitcases and walk freely about the city. What a treat! We saw lockers in the small towns of the Berner-Oberland, and now in Spiez. There is luggage storage in many Italian stations, with an attendant who will charge a few euros for a few hours of storage. However, some of these close (of course!) for la pausa at midday. So if your train is at 13:00, you may not be able to retrieve your bag because la signora who took your euros and gave you a claim check is enjoying her 90 minute lunch, obviously away from the train station since there is not a nice Bahnhoff Buffet. If you are ever in Spiez, don’t hesitate to eat at the train station. If it’s Sunday, you might want to call ahead for a reservation! On the last day of Christmas…. If you were a tourist in Rome today, Epiphany, you’d have awakened to beautiful sunshine. Perhaps desiring to go to Piazza Navona and see Bernini’s masterful Fountain of the Four Rivers, sipping a glass of wine in a cafe, gazing at the fountain. Ah, bliss! Except when it is La Befana or L’Epifania, a national holiday. 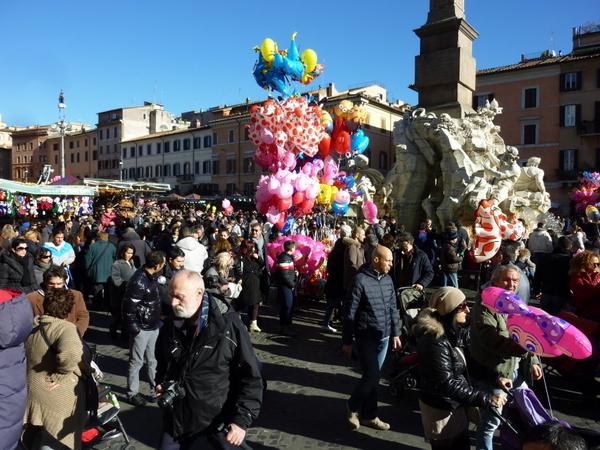 It seems every family in Rome was there today to visit the Christmas market one more time. Balloons and strollers, parents and grandparents, vendors and street performers: Absolute madness. Today was the LAST day of the 12 days of Christmas. Tomorrow is back to school! Thanks for the amazing blog posts! Every adventure you write up makes me feel as if I were right there too. What a great gift! Happy New Year 🙂 –R. Ciao Rachel! I appreciate your kind words. Miss you guys! Send a picture of the kids, OK? Ah – dear friend – your blog just makes my heart pine for more travel in Europe! 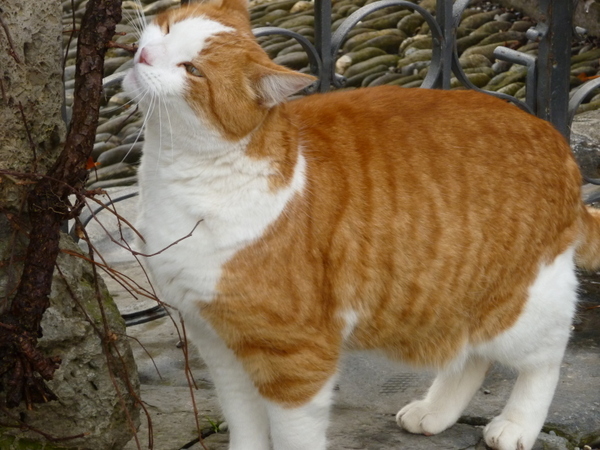 It takes a great deal of effort to continue the blog and please know I devour EVERY morsel! Thank you for allowing us to live vicariously thorough your adventures! Sharon your comments also made me pine for NYC and WDC! So – now that I’ve decided to sell my home in Oregon and relocate to the Sarasota area of Florida, I will have easier access to the rest of the world that is beckoning me to explore or revisit! Happy New Year! Keep the light on for me! Fear Barbie, Yes flying from the east coast much easier. Once you are resettled…. Happy New Year Laurel & Ric! So happy to hear you enjoyed your little sojourn to Switzerland! So close but yet so far! Grand Central Terminal has some outstanding restaurants…the Oyster Bar dates back to the station’s opening in 1913! There are about 4 or 5 white tablecloth establishments to augment the fast food places. Washington’s Union Station also has some very nice options. Also I notice that airports are getting more and more sophisticated restaurants (probably the result of holding us captive for so long). Buon Anno, Sharon! I guess those east coast stations have more options! Perhaps a return to former glory? I do recall that Union Station in D.C. has become a bit of a dining destination, not just for those traveling through. Had no idea about Grand Central, but have not been there in an embarrassing number of years! Time to return to NYC for a weekend!